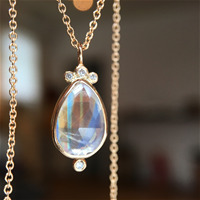 Fine handcrafted designer jewelry made in NYC of one of a kind gemstones fabricated in 14k gold and sterling silver. Each hand selected stone is showcased in a simple, organic setting to highlight its natural beauty. 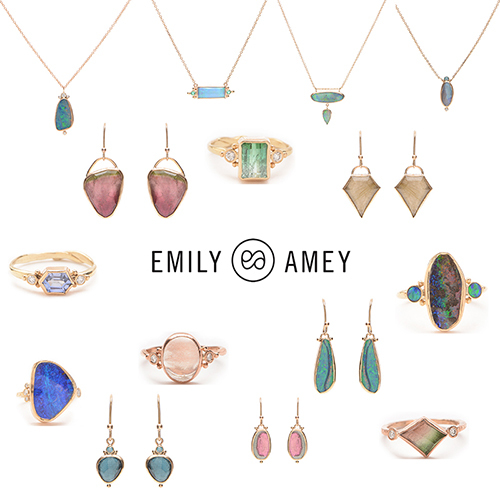 Vibrant tourmaline, boulder opal and moonstone are some of our favorites. Color is the name of the game, and Emily scours the globe in search of the best, most unique gemstones available. She showcases these natural wonders by creating silmple settings and by sculpting organic forms out of soft wax to create ring bands that are idiosyncratic and distinct. She works primarily in silver and gold, and uses recycled fine metals and responsibly sourced gemstones whenever possible. The entire jewelry-making process, from design to full-scale production, is completed domestically with the majority of it done in-house at Emily's New York studio.